When I pictured the perfect trip to Yellowknife, it included some kind of northern adventure. A unique experience that I couldn’t get in the suburbs of Ottawa – something memorable, perhaps with an element of danger or calculated risk. A story I could tell my kids about, one that would make their eyes would grow wide with wonder. In an abandoned gold mine on the outskirts of town, I got my wish. After about 15 minutes of exploring the Ptarmigan Mine, I came to a large, roofless building at the bottom of a hill. 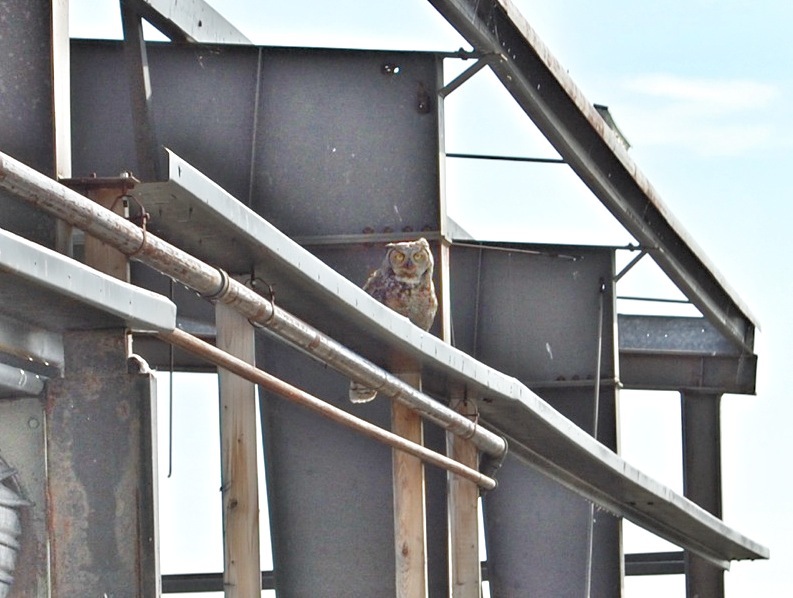 I heard a hooting sound and looked up to see a beautiful Great Horned Owl perched on a girder. I snapped a photo and then walked through the open door, intent on exploring the interior. I was suddenly aware of a large shape rushing towards me, and I quickly ducked back outside. Dozens of small birds hiding inside the building began to tweet furiously. I glanced around and the owl was gone – it had clearly decided that I was a trespasser and needed to be scared off. Message received. I looked around outside and saw the reason for the owl’s hostile reaction to my visit. 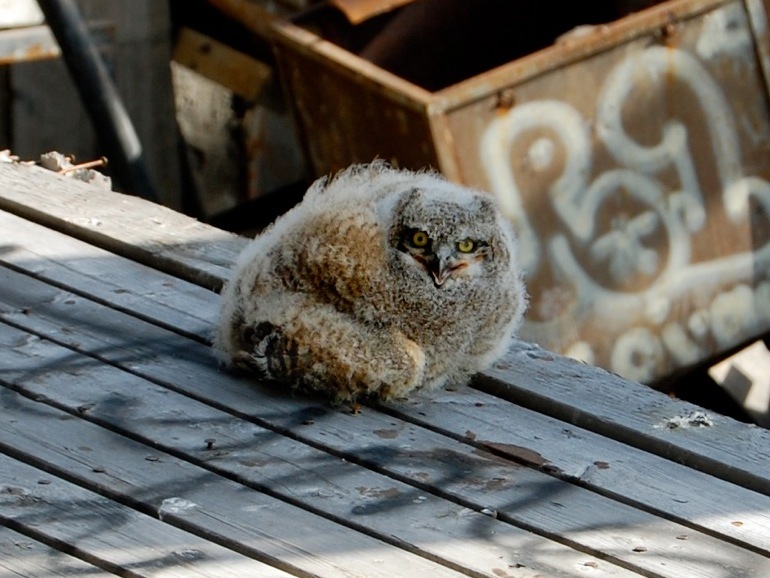 A cute baby owl sat on the floor of the building, and it stared at me with clear contempt. Not wanting to risk another attack, I skirted the building and took a few photos from the opposite end. I left the mine a few minutes later, walking with a spring in my step. 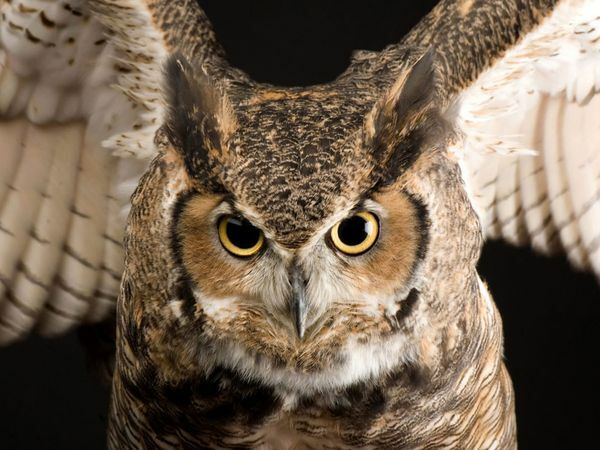 I had been menaced by a great horned owl at an abandoned gold mine – a nice adventure story to tell the boys. The next morning, my colleague Heather suggested we go back to the mine before our flight departed for Inuvik. She wanted to see the mine for herself, and it sounded like a nice way to kill some time before departing for the airport. Twenty minutes later, I led her on a tour of the mine, retracing my steps from the previous day. As we approached the processing building, I scanned the rafters for the owl. 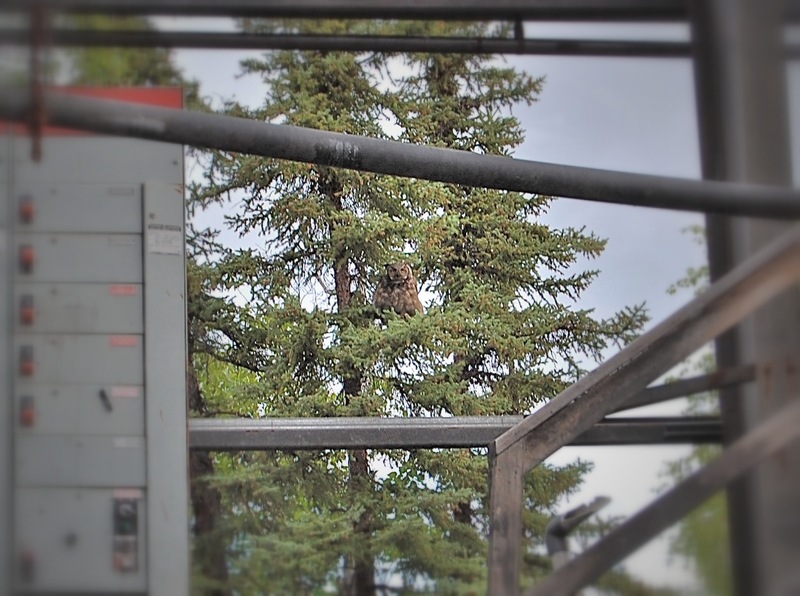 After a few seconds, I spotted it perched in a pine tree just beyond the building. I took a few steps forward, trying to get a couple of pictures of the owl framed between the exposed metalwork. She began to shuffle from foot to foot, her bright yellow eyes locked on me. “Um, it’s starting to move,” warned Heather. I got back to my feet and started to run, worried that this was just the first volley. I looked around frantically, but couldn’t spot the owl anywhere – she had simply disappeared. I pulled my hand away from my head, expecting to see it covered in blood, and was relieved to find nothing. Heather and I headed back to the car, my heart pounding and my mind racing. 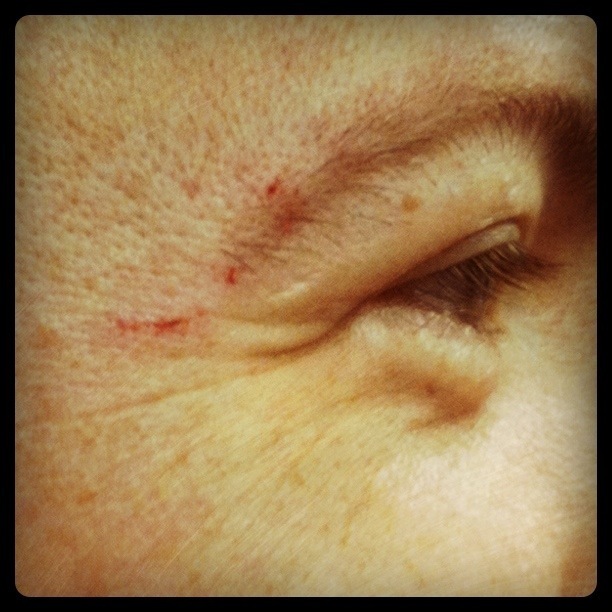 I looked in the mirror and saw three small scratches beside my eye. In the days following the attack, I considered how lucky I had been. I imagined different scenarios, including one where the owl plucked out both my eyes with her sharp talons, like some kind of Old Testament punishment. In case it isn’t already clear that I acted foolishly, I had ignored another warning about the owl. After the first encounter, I Googled the mine and came across a story on Northern News Services. A journalist and a photographer had been at the mine a couple of weeks earlier, and the photographer had been attacked by the owl. In his case, the owl drew blood. You can find the article here and the journalist’s blog post here. So in the end, I got my adventure story. It was truly one of the scariest and coolest things that has happened to me in a long time. I can’t wait until my next visit north (likely Whitehorse in October) and the promise of another adventure – suggestions are welcome.